DxO Optics Pro 9.1.4 – Image enhancement for RAW and JPEG files. 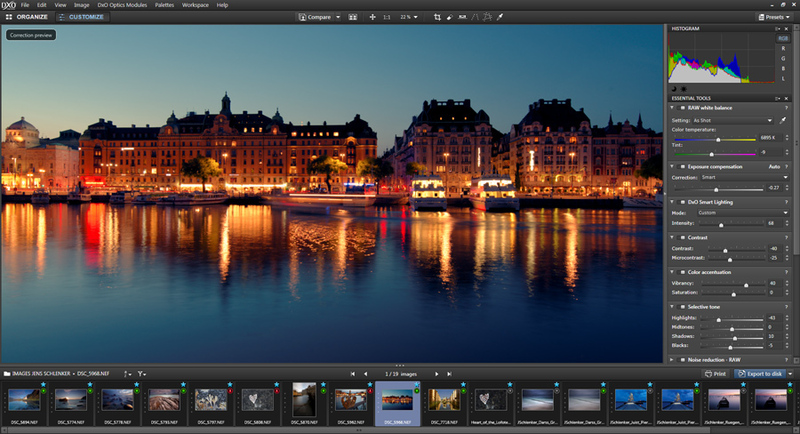 DxO Optics Pro is a unique application that automatically increases the quality of images taken with supported Digital SLRs and Bridge Cameras, whether in JPEG or RAW format. Photoshop no longer treats JPEG and TIFF images generated by DxO Optics Pro as RAW files when the "Preserve metadata data in XMP sidecars for RAW images" option is activated. Next story PopChar X 6.5 – Floating window shows available font characters. Previous story DxO ViewPoint 2.1.4 – Spectacular perspective and volume correction. Adobe After Effects CC 12.2 – Create professional motion graphics and visual effects. iScrapbook 4.0.8 – Design and print beautiful scrapbooks. Intaglio 3.5.3 – Drawing and illustration application.